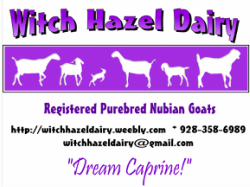 This page is to remember all of the Witch Hazel goats who have died. We love all of our goats and I don't want to ever forget them. Blaze was a fine wether, he was clicker trained, packer, and I was training him to cart before he passed. He was sweet, willing and not pushy. I will always miss him and am sorry he died at only 1 year. It is Blaze as a baby that is the main Header Picture for the website. 2015: Sarina, at 9, is having an excellent year so far. She was bred to Ninja (to repeat the breeding that produced Sulu and Samari) and enjoys excellent health, her daily soaked beets, and chasing Hazel's dog, Archer. 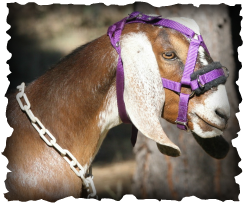 2014: No internet at home and Hazel was taking an online Geometry course so could not update goats! 2013: This year we will be drying Sarina off early, to lengthen her life span. We truly love this girl, with all of her quirks. She has mellowed down considerably and is much nicer to handle now. We hope to keep a buckling from her and maybe another doe. I don't think that we will be showing her this year but, she did get her SG, so I am happy all the same. 2012: Sarina is our Herd Queen and takes her job seriously. Yet, she is sweet and nice in the milking parlor, a very gentle manner in general. She came to me when she was five years old and is still doing well but, she had FIVE years of bad habits for me to deal with. I have worked around them or pulled her out of them (for the most part). She is really the into sameness, If I am late to milking I sure hear about it! Two of Sarnia's kids. Lost a year apart.